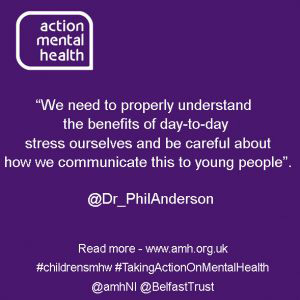 Dr Phil Anderson, is a Consultant Psychiatrist, Child and Adolescent Mental Health with the Belfast Health and Social Care Trust. 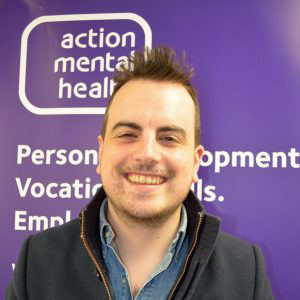 Action Mental Health has teamed up with local experts like Dr Phil Anderson who today – during Children’s Mental Health Week – shares his expertise on Understanding Stress among young people. In any part of life, the key to managing a problem is truly understanding what the nature of the problem is in the first place. This is no different to young people facing the problem of stress. Stress is widely understood as ‘bad’ and ‘something to be avoided’. There can be often be a misunderstanding that day-to-day stress causes similar harm to the toxic stress I previously discussed. The stress response is our bodies’ way of helping us perform at our best and keep us safe from harm. Stretching ourselves beyond comfortable limits, whether playing sport or sitting an exam, will not always feel nice, but our development as a person and our abilities cannot happen any other way. Avoiding stress does not really work and in the end is not really possible. Mindfulness can be an effective way of gaining better understanding and control of our stress. It is the process of bringing focused attention to experiences occurring in the present moment. A large volume of research has demonstrated the benefits of mindfulness in developing our emotional resilience. Children can learn to pay focused attention and help regulate difficult emotions even in the most difficult challenges life can throw our way. There are a variety of ways of exploring this with young persons, depending on their developmental stage. This can include deep breathing (one hand on stomach, to one on the heart) or use of mindfulness phone based applications. Dr Phil Anderson is back again tomorrow to talk about Healthy Habits.